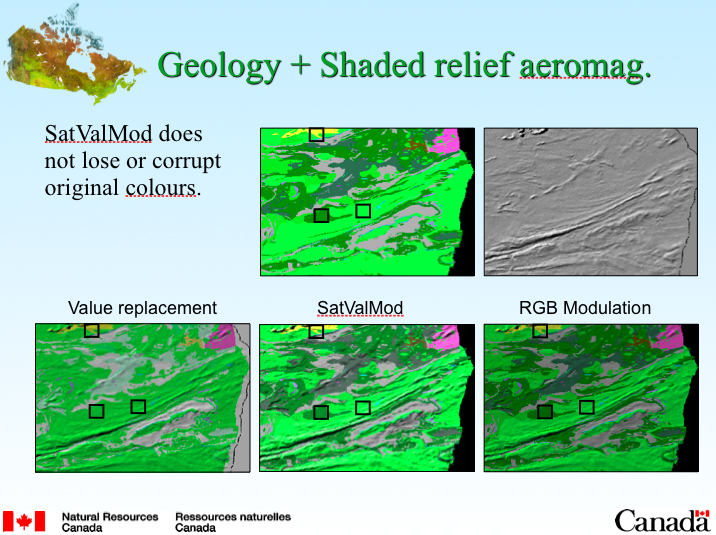 I developed the SatValMod (SVM) method to address the problems associated with traditional methods of integrating color with gray-scale raster data (e.g. 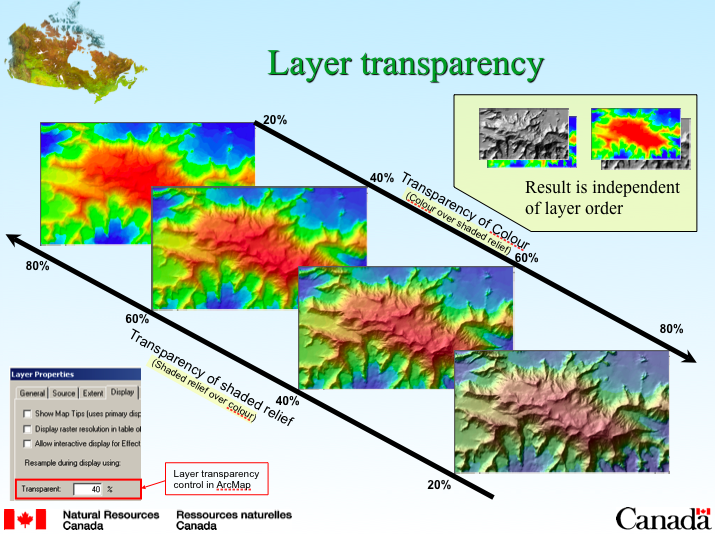 layer transparency, multiplying color by gray-scale values, etc.). The main problem with traditional methods is color loss or corruption. SVM does not change the original hue and modulates the saturation and value so that the final output has the same rich colors of your input data. SVM does not require Spatial Analyst. It supports Grid, BIL, and TIF formats for input. It outputs a BIL file. The SVM method involves a pixel-by-pixel transformation of RGB color coordinates to HSV space, modulation of the saturation and value color components, and transformation of the orginal hue and modulated saturation and value components back to RGB space. More details are available in the PowerPoint slide show included in the ZIP. This technique can work with rasterized polygon layers. You will need to create a CLR file that relates pixel values to the polygon colors. 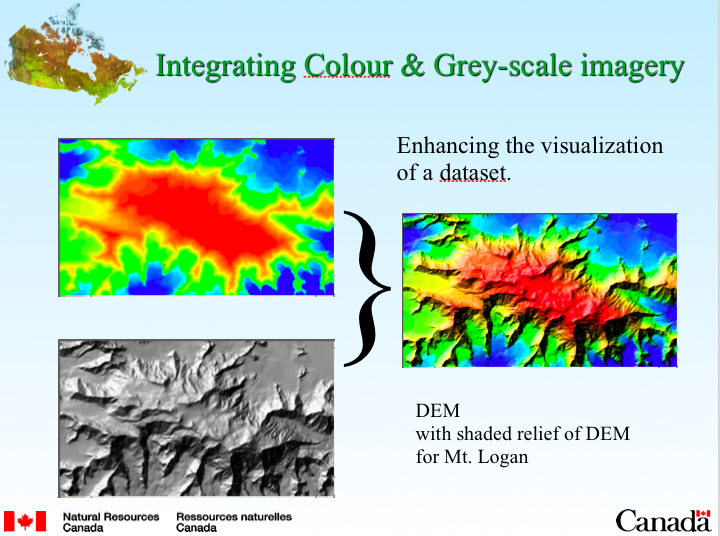 I hope you find SVM useful in creating your color/gray-scale image integration products. Download from ESRI . . .
Republished from Adobe Developer Connection. By Dr. Woohoo @ blog.drwoohoo.com. Follow along with this tutorial to expand on what we created in the previous tutorial, PatchPanel: Integrating your ExtendScript, with the objective of using a framework that embraces running our Flash plug-in in multiple Creative Suite applications (Photoshop and Illustrator). When we are done, our Flash plug-in will work in all three CS applications using code that is appropriate for each host application― keeping in mind that this is necessary due to the differences in the DOMs of each application. Our Flash plug-in will get the RGB values of the foreground color of the host CS4 application. You will integrate a separate ActionScript file for each host application within the Flash plug-in that you develop within a Flex Builder MXML project using the PatchPanel SWC library as the mechanism for communicating between your SWF and the host application, which will dynamically be defined in this example. Continue reading at Adobe Developer Connection . . .
Republished from The Washington Post Monday January 12, 2009 (A01). Bush Econ: A Legacy of Little Growth (view original). 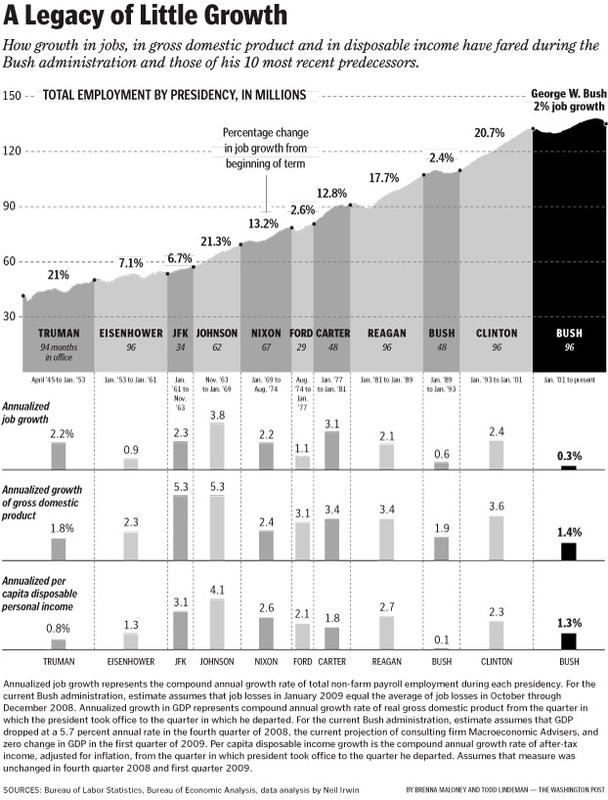 How growth in jobs, in gross domestic product and in disposable income have fared during the Bush administration and those of his 10 most recent predecessors. President Bush has presided over the weakest eight-year span for the U.S. economy in decades, according to an analysis of key data, and economists across the ideological spectrum increasingly view his two terms as a time of little progress on the nation’s thorniest fiscal challenges. The number of jobs in the nation increased by about 2 percent during Bush’s tenure, the most tepid growth over any eight-year span since data collection began seven decades ago. Gross domestic product, a broad measure of economic output, grew at the slowest pace for a period of that length since the Truman administration. And Americans’ incomes grew more slowly than in any presidency since the 1960s, other than that of Bush’s father. Bush and his aides are quick to point out that they oversaw 52 straight months of job growth in the middle of this decade, and that the economy expanded at a steady clip from 2003 to 2007. But economists, including some former advisers to Bush, say it increasingly looks as if the nation’s economic expansion was driven to a large degree by the interrelated booms in the housing market, consumer spending and financial markets. Those booms, which the Bush administration encouraged with the idea of an “ownership society,” have proved unsustainable. Continue reading at The Washington Post . . .